Along the way we were fortunate to attract exceptional customers who appreciated our creativity. As our reputation spread, we gained more and more valued customers. We understood the requirements of our customers, and we created award winning signs. In these 25 years, Plasty Prod succeded in entering the top of the largest Romanian companies acting in the field of advertising production, by increasing it’s contribution to the share of capital, it’s turnover and it’s launching, in 1997, on the international market with projects meant exclusively for one of it’s most important clients on the market. The profit reinvestment into equipments and production facilities was the company's key of success. With the help of the purchased equipament, Plasty Prod succeeds in completely satisfying, with its own resources, in the best terms of production and installation, the requirements of its clients, providing variable, guaranteed quality products.. The equipament should be backed up by quality, reliability and continuos support. Creating products with a special visual impact, strongly related to the architecture of spaces they are placed into. By introducing new materials with esquisit finishes, along with introducing new technologies, with a high efficiency. Open approach of discussions with clients, taking into account their requirements and attentive to the market trends. 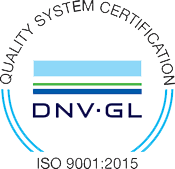 Introducing new technologies, computerized control of the technological procedure (ISO 9001:2015 certification). Using raw materials with international quality certifications, and by introducing new materials with esquisit finishes. For evaluation, authorization, mounting, maintenance during the guarantee and post-guarantee period.